In a small sauce pot, combine the freekeh and 1⅓ cups [2⅔ cups] water, salted, if desired. Bring to a boil, reduce to a simmer, cover, and cook until the freekeh is tender and the water is absorbed, 18 to 20 minutes. While the freekeh cooks, prepare the stew. Peel and thinly slice enough onion to measure 1½ cups [3 cups]. In a large frying pan [large sauce pot] over medium-high heat, warm 2 to 3 teaspoons oil until hot but not smoking. Add the onion and cook, stirring occasionally, until starting to soften, 2 to 3 minutes. Stir in the tomato paste and cook until caramelized, 1 to 2 minutes. Stir in the turmeric spice blend and cook until fragrant, about 1 minute. Add the butternut squash and 1½ cups [2½ cups] water and bring to a boil. Reduce to a simmer, cover, and cook until the squash is tender, 15 to 18 minutes. Stir in the chickpeas and cook until warmed through, 1 to 2 minutes. Remove from the heat and season to taste with salt, if desired, and pepper. When the stew is almost done, prepare the mint and the garlic yogurt. Strip the mint leaves from the stems; coarsely chop the leaves for garnish. In a small bowl, stir together the garlic yogurt and 1 to 2 teaspoons [2 to 4 tsp] oil. Season to taste with salt, if desired, and pepper. Transfer the freekeh to individual bowls and top with the butternut squash stew. Garnish with the garlic yogurt and mint and serve. Measure the water for the freekeh and the stew. Garnish with the garlic yogurt and mint. 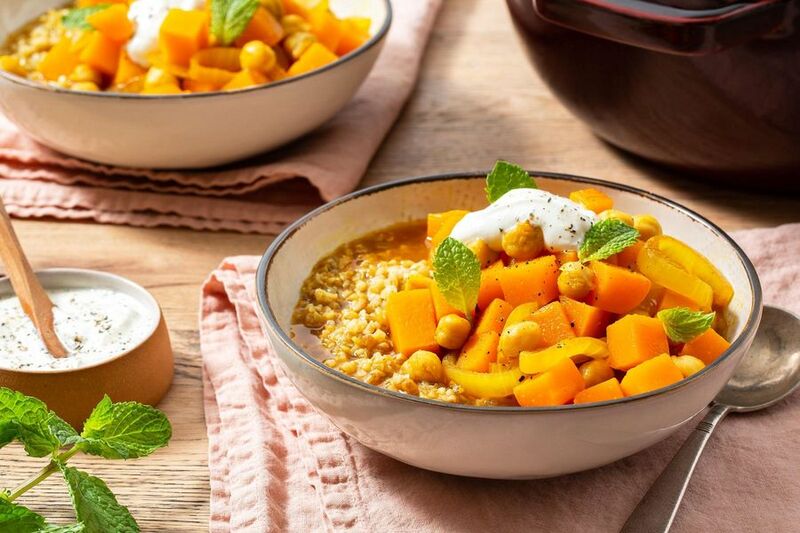 Based on the Afghan dish borani kadoo, this butternut squash and chickpea stew is the perfect cozy dish for autumn. The Heart-Check Certification indicates the recipe meets the American Heart Association®’s nutrition requirements. To remain at or under the maximum 600mg sodium per serving, use no more than ½ teaspoon salt to season this recipe. We also recommend using the lower amounts of oil suggested for preparation. Freekeh is wheat that has been harvested before the grain has ripened and is then roasted or sun-dried. Boasting a wealth of nutritional benefits, it’s full of fiber and contains minerals such as selenium, potassium, and magnesium. The freekeh and the butternut squash stew (Steps 1 and 2) can be prepared up to 1 day ahead. Let cool, then cover and refrigerate separately overnight. When ready to serve, gently rewarm separately, adding 1 to 2 tablespoons water to loosen the stew if needed, as you proceed with Step 3. Calories: 490, Protein: 21g (42% DV), Fiber: 15g (60% DV), Total Fat: 11g (17% DV), Monounsaturated Fat: 6g, Polyunsaturated Fat: 1g, Saturated Fat: 1.5g (8% DV), Cholesterol: 5mg (2% DV), Sodium: 70mg (3% DV), Carbohydrates: 85g (28% DV), Total Sugars: 12g, Added Sugars: 0g (0% DV). The Heart-Check Certification applies to original recipes only and does not apply when a protein customization is utilized.